How to price web design services and make money! Pricing is hard. Figuring out what people will pay, and what you need to make, and closing any gaps in between can be tricky. A lot of designers get hung up on how to price web design services. I like to to use a combination of gut feeling and math. Pricing needs to feel right, but also make sense financially. When you think of your services, and all the value you’re providing, what feels right to you? Does your new website package feel right at $3,500? How about $5,000? I’m a firm believer that your prices should make you just a little bit nervous. If you feel 100% comfortable, you’re likely charging too little, and will end up frustrated if a project doesn’t go perfectly smoothly. If you’re instead just a little uncomfortable with your rates, you have some wiggle room for the inevitable hiccups that come along with creating websites. By the time you finish, you’ll probably feel comfortable with the rate you set. A few more projects like that, and you’ll be ready to raise your rates again. How much money do you need to make? Do you know how much money you really need to make? Start there, so you have a realistic number that you need to hit. Write down what you’re currently charging for each product or service. For new products or services, write down what you’re thinking about charging. How many of these services can you offer in a month? For most designers, a full website design and development takes at least two months. So the answer would be half a website. But you may be able to juggle multiple projects at a time. Side note: In general, I don’t recommend taking on more than two website builds at once. Otherwise it’s hard to stay on track and provide a great level of service. Look at your life plan and ideal week. If you’re only working three days a week, you should probably only be building one website at a time (unless you are SUPER efficient and have SUPER efficient clients). Figure out how long each website or other service will take, and realistically how many you can handle each month. How many services do you expect to sell in a month? Just because you can handle two websites a month, doesn’t mean you’ll sell two. Maybe you’ll sell one, and then you’ll also sell three maintenance packages. Look at your sales history and make an educated guess on the number of each service you think you can realistically sell. Side note: If you think you’ll sell OVER what you can handle, it’s probably time to build a team! What if you don’t expect to sell a big service like a website build every month? How often do you think you’ll sell these bigger items? Once every two months? Three times a year? Write it down. How much do you need to charge? Based on the number of services you think you’ll sell each month, how much would you need to charge in order to reach your income goals? Let’s say your income goal is $3,500 per month. Your current website project price is $1,500. You expect to sell one website per month (so even though they take two months to complete, you’re getting paid for a full website each month as you finish one and start the next). Your new maintenance plan price is $50 per month. You expect to keep four clients on monthly maintenance which means you’d be making $200/month on maintenance. Your total projected income each month is $1,700. Which is $1,800 shy of your income goal. Ouch! How can you make up this difference? You can either sell more–which means more work: hustling up clients, working with them, and taking on more work. A lot of designers do this and end up working long hours and nights and weekends. That’s what we’re trying to avoid. Or, you can raise your prices. Now, it’s not just as simple as changing the price on your website. I promise that clients who purchase $1,500 websites expect less than those who purchase $5,000 websites. But the difference is not so great that it should vastly affect the amount of time you spend on each project. In fact, a lot of it has more to do with how you present yourself than what you offer. Make your largest packages cover your monthly income goals. If you need to make $5,000 per month, that should be the starting price of your website packages. But how do you sell people on a website that costs more than double what you were previously charging? First, it’s all about positioning. Look at your Ideal Competition. They are likely charging even more than $5,000. How do they position themselves? How do they convince potential customers that they’re worth it? Take a look at the language they use and how they explain the benefits of working with them. They might be offering the exact same thing you are, but the perceived value is higher based on their positioning. Next, think about how you can add real value to your website projects that will benefit your clients. Simple things, like 15-minute weekly Skype check-ins, really informative intro packets, great customer service, and stellar website strategy can all be easily added to what you’re currently offering. How do you help your clients? Focus on selling the benefits and results of working with you, not the website. Side note: The customer service and website strategy should already be included in ANY website design, but it doesn’t seem as though many designers explain these or show the benefits, so play them up! The point is to make your packages as valuable as possible, so that you only need to sell one each month to reach your income goals. This works whether your goals are $5,000 or $10,000. With proper positioning and added value, you can make website packages that meet your clients’ needs and yours. And oddly enough, it’s not really any harder to sell a $5,000 website than it is to sell a $150 one (I’ve done both, and yes, that’s one hundred fifty, not fifteen hundred) as there’s an audience at any level. 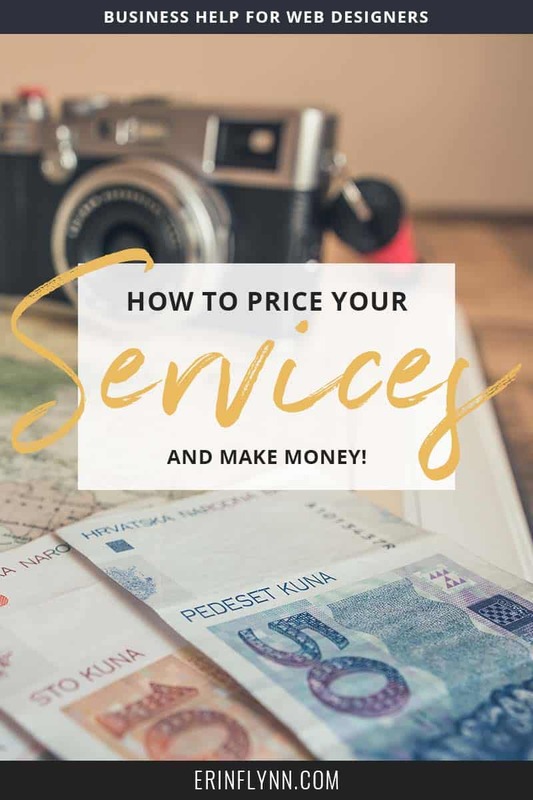 And, if your main packages cover your income goals, anything else you sell can fill the gaps for when you’re not booked, or when you just want to take some time off. Reevaluate, restructure, and re-position your offerings to provide more value for your clients, and to cover your income goals. Be sure to explain the benefits to working with you–and be sure to follow up on these promises. Then, get your new pricing online.